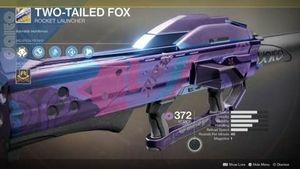 The Two-Tailed Fox is an exotic Rocket Launcher featured in Forsaken. It fires two rockets simultaneously, one Void and one Solar, that can track onto the same target. It is a weapon from the Daito foundry. My explosive (POWER) will never be erased! Your (NON-STOP POWER) cuts the night! Your (NON-STOP POWER) erases all doubt! Chaos! Fire! Chaos! Fire! Chaos! Fire! I have the (POWER) of my (KITSUNE)! Twintails: Shoots two rockets, one Void and one Solar, that can track onto the same target. Confined Launch: This weapon's launch parameters are particularly stable. Greatly increases stability. Increases blast radius. Decreases projectile speed. Play with Your Prey: The Void rocket suppresses enemies. The Solar rocket causes damage over time. The Two-Tailed Fox fires two rockets for the price of one ammo, one rocket uses Void, the other uses Solar. There's a small fox at the bottom of the reticle. Once locked onto a target, it changes color and takes on a more mad expression. The Two-Tailed Fox is by far the biggest Rocket Launcher. Being almost twice the size of most Launchers. The Two-Tailed Fox makes a small squeak noise reminiscent to a Fox when drawn. A Guardian wielding the Two-Tailed Fox in the Forsaken weapon trailer.